86 - Γεωργιος Κοντοπουλος - Κωνσταντης - 40 - κλητηρ δικαστ. 139 - Dimitrios Iliopoulos - Ilias - 60 - ? 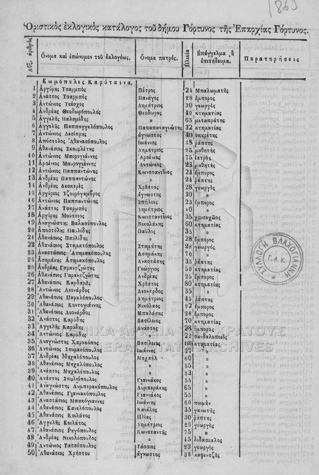 188 - Ioannis Bertsos - Anastos - 45 - ? Thank you so much!! It's my paternal grandfather's village. Thank you so much. I just figured out the next generation - my paternal grandfather's, mother's, father....if you can figure that out! My father and I have been working carefully through your list. It will take me several days to type of the results of our exercise, but it has been tremendously fruitful, as it turns out there are many relations on this list. I cannot thank you enough. I am so happy that you have found this posting on Karytaina useful. Good luck with your future research. Dena - Very nice job with the spreadsheet! I have been overwhelmed lately with a lot of my own family connections - or not connections. This is a great way to put all the data in one place and try to make the correct connections. Thanks for sharing. Kyria Georgia, I am going through these lists to find names, which are common to the villages I am working on, as we know there are antescedents. So far I see Zoulfos, there was one family in Vamvakou, Tsouni( Kokkinorachi) Spartis. Also see numerous Perdikis, also of Vamvakou, Tsouni and Kyriakopoulos of Megali Vrysi- Oinountas- Lakonia.Thank you, another puzzle piece.